My Dad passed away a few weeks ago. Since then my Mother has been facing the fact that in the near future she will probably be selling their home and moving somewhere smaller. In the process, she has told me to "take what you would like to have". One day recently I was looking through her chest of drawers full of mine and my brother's baby things. It was like looking through a faded lens into my mother's life, her days as a young mom and making a home for her family. There I found this set of baby bedding which belonged to me. 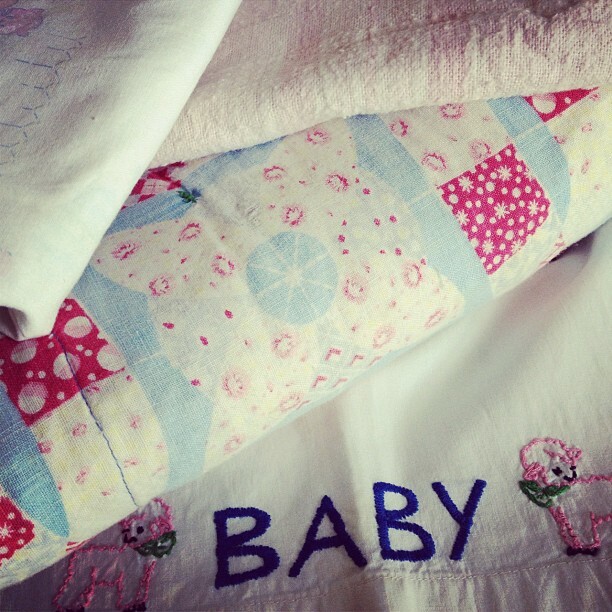 A little handmade baby quilt, a sweet pillowcase embroidered in her own hand, a faded pink receiving blanket, and a still crisply pressed crib sheet. I could just feel the love that she felt for me just by holding these old textiles in my hands. The way she had lovingly stored them all these years and treasured them. It made me stop and think how our homes and the things we hold onto through the years connect us in such a real way to the people we love. It made me think about what I will leave behind for my children. What will they see through that faded lens that distills my life down to what I treasured and what meant the most to me? I'm so sorry for your loss. Thoughts I've had too when I lost my mom and dad. Your baby quilt has been treasured by your mom and how wonderful for you to have it while you can tell her how much it means. I found my baby dress and shoes after it was to late.